Help! 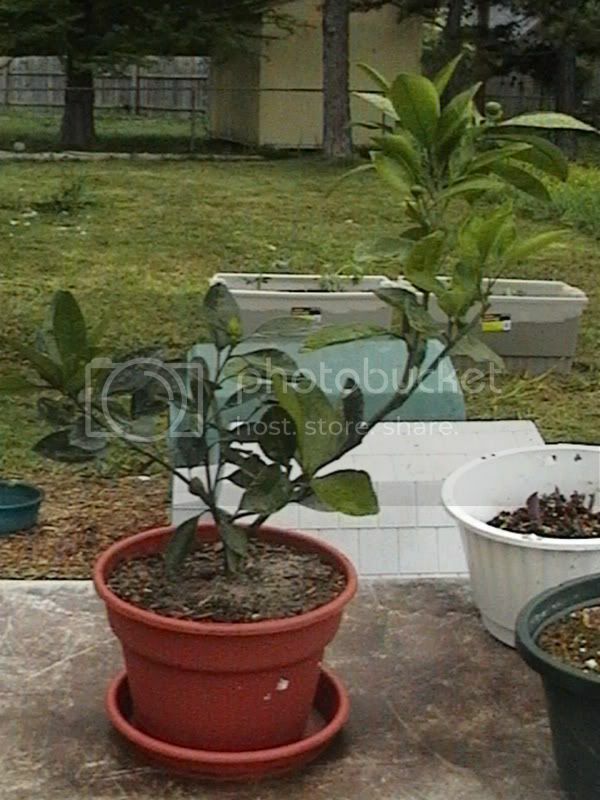 My citrus tree is dieing!! I have a tiny baby citrus tree. I don't really know what kind of citrus it is yet. I don't remember exactly when I bought it but I do know this is it's first fall. I've kept it outside in the planter that I bought it in. It was doing great with new growth and everything. It had about 6 or 7 or so little balls of fruit growing on it. All but 2 of the fruits had fallen off. I figured this was because the tree was too young to bare that many fruits. Anywho, when it started getting too cold I brought the tree indoors. Since then I've kept it indoors only. 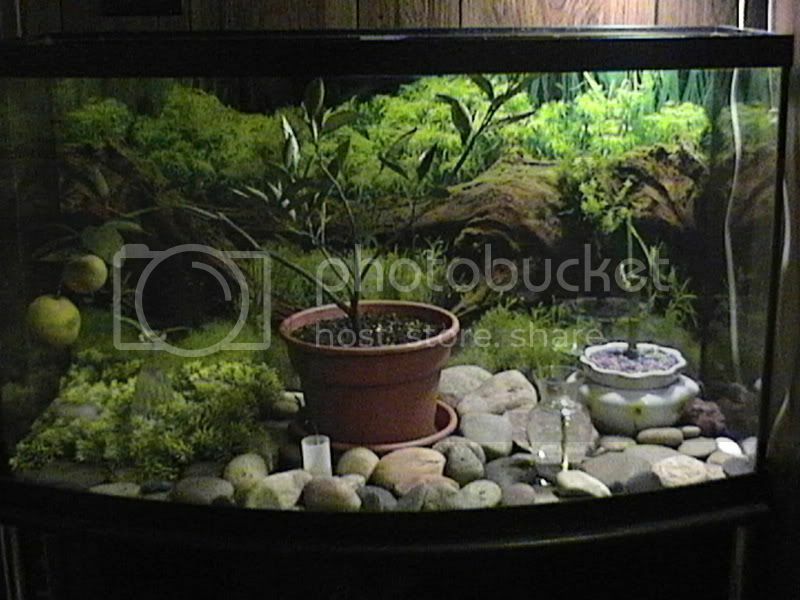 I keep it in a 46 gallon bow front fish tank with a small plant light hanging over the tank. It was doing great. 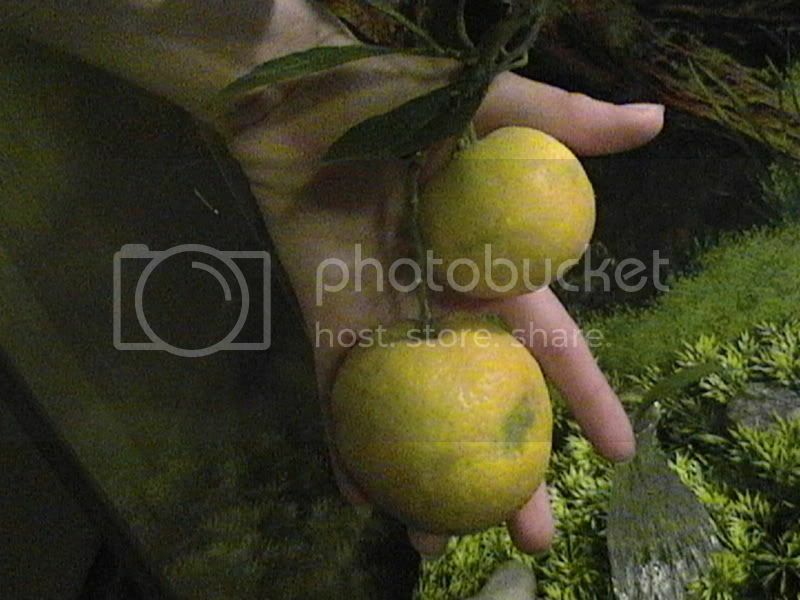 The two fruits have grown a bit larger and have changed from green to yellowish/faded orange. I would say the fruits are lemons but I noticed the oranges in the grocery store are really yellow for being an orange. Not to mention the shape of my fruits are no where near the typical shape of a lemon. The citrus tree kinda began to drop it's leaves before I brought it indoors. 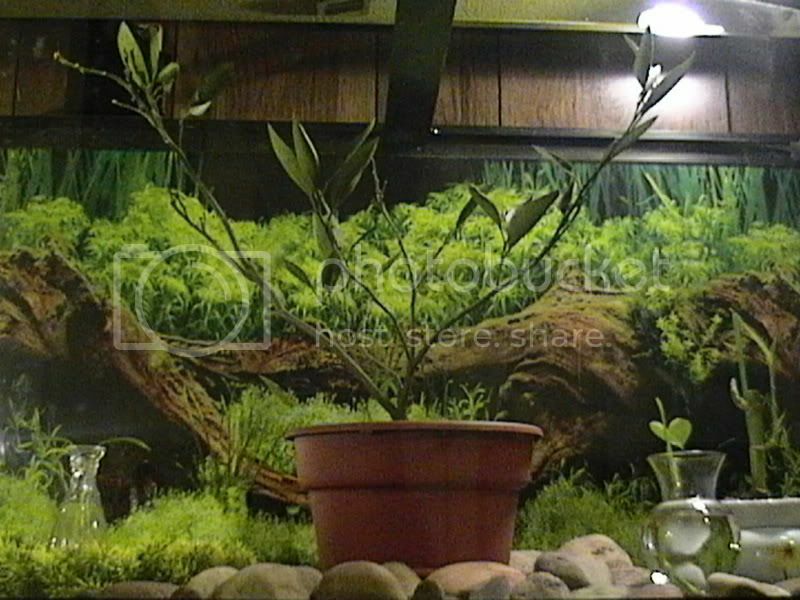 When I did bring it in and put it in the fish tank the leaves started to look healthier. It even bloomed one more flower which gave out a new tiny ball of fruit. But not long after the flower wilted away from the fruit did the fruit eventually fall off. The other two fruits are still hanging on. One fruit is about two times bigger than the other. Though, both fruits are of the same color. Both fruits are right next to each other and they are weighing down the branch quite a bit. I'm not sure if I'm supposed to pick the fruits off now or wait? I've been giving it the same care since I've brought the tree indoors. But for some reason it is dropping it's leaves like crazy! There are only 29 leaves left. There were soooooo many more leaves than that to begin with. And there is not any new growth happening anywhere. Some of the leaves will fall off green and then turn brown and dry up. Where the other leaves will turn brown and crispy while still on the tree. So.... As I mentioned before, I've kept my tree in the same planter I bought it in. I haven't added anything to the soil. I thought about maybe transplanting it but I've been told not to mess with it while it was barring fruit. Sorry about the length. I tend to love to write/type. But anywho, Can anyone tell me what I'm doing wrong? Grey are you out there? 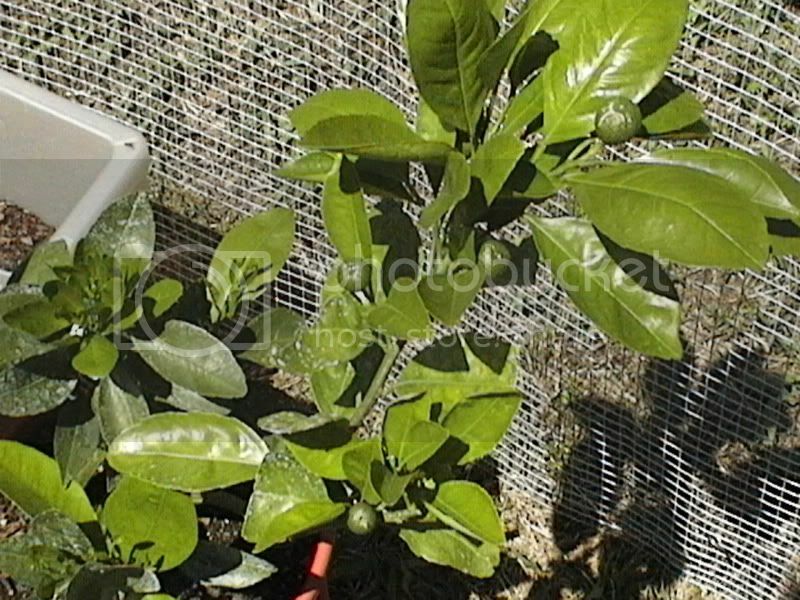 Or does anyone else have experience with citrus trees? Here's my thoughts. I'm going to put together what you have said in the order that I think could be helpful and the problem or part of the problem. 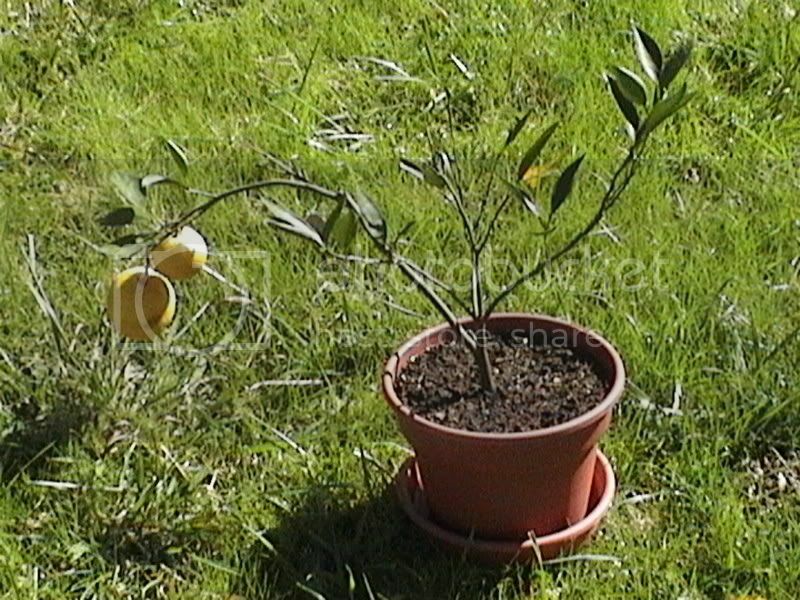 ...a tiny baby citrus tree. ...when it started getting too cold I brought the tree indoors. The citrus tree kinda began to drop it's leaves before I brought it indoors. If it was dropping leaves before you brought it in, I suspect that either the nights were too cold or the plant is rootbound and needs a new pot about 2" larger or both. A sudden change of temperature will cause leaf drop, so moving it indoors has also contributed to the problem. 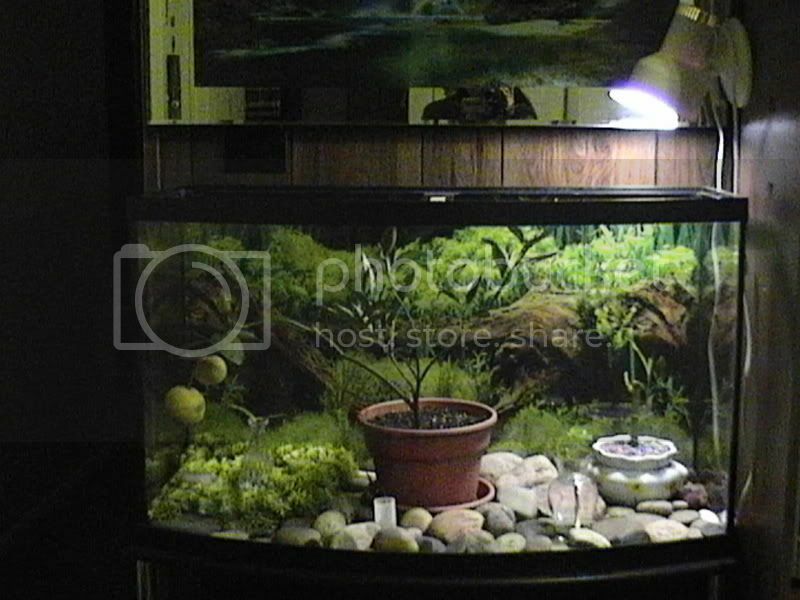 I keep it in a 46 gallon bow front fish tank with a small plant light hanging over the tank. When I did bring it in and put it in the fish tank the leaves started to look healthier. That leads me to think that it needed the warmer temps. But not long after the flower wilted away from the fruit did the fruit eventually fall off. The other two fruits are still hanging on. Both fruits are right next to each other and they are weighing down the branch quite a bit. I'm not sure if I'm supposed to pick the fruits off now or wait? It's not uncommon for young fruit trees to lose 80% to 90% of their first and second year crop and it's best to remove all the fruit so the tree can grow a strong root system. As I mentioned before, I've kept my tree in the same planter I bought it in. I haven't added anything to the soil. I thought about maybe transplanting it but I've been told not to mess with it while it was barring fruit. I've been giving it the same care since I've brought the tree indoors. But for some reason it is dropping it's leaves like crazy! And there is not any new growth happening anywhere. With all that is going on with your little tree I suggest you take a look to see if it's rootbound. This is what it would look like. You will need to water a day or two before so the soil is moist and not too wet or too dry. GENTLY remove it from the pot. If it's rootbound then it's time for a new pot. 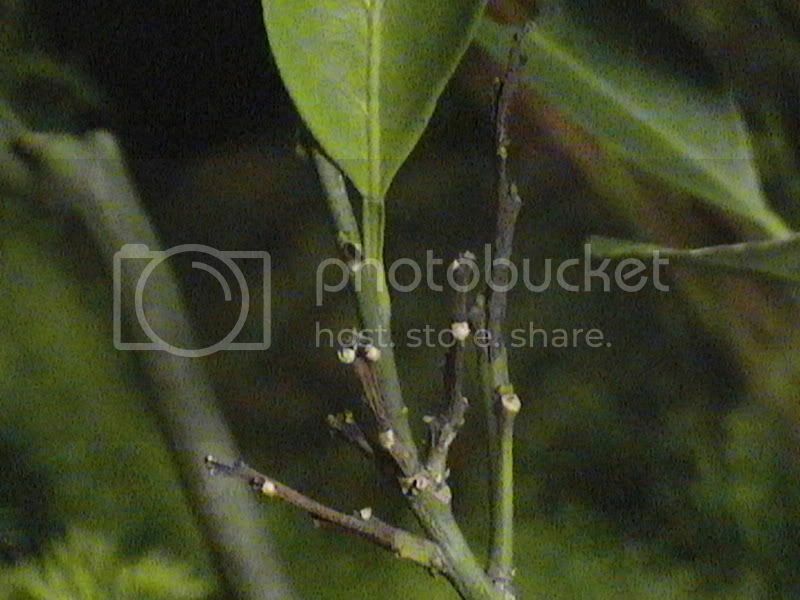 Once you see new growth it would be best to use a citrus fertilizer. If you can't find one, use an organic one like fish emulsion to help your tree along. 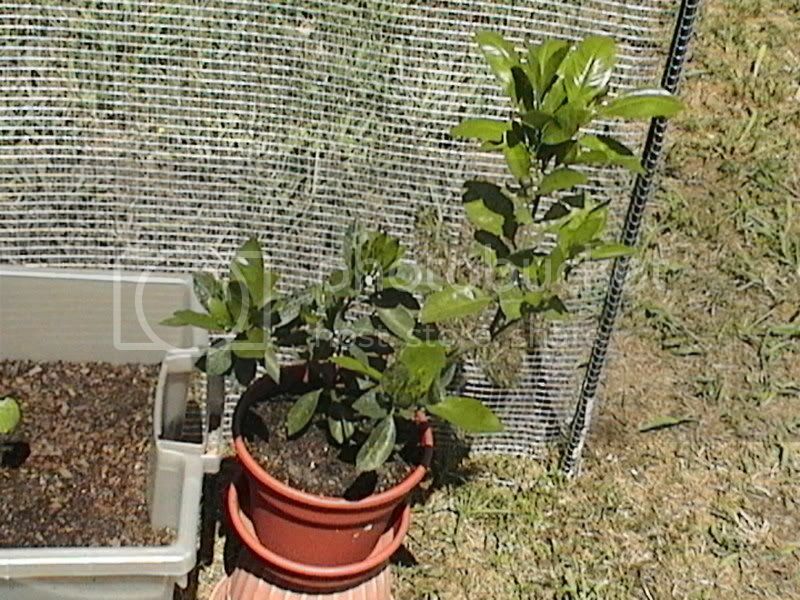 Here's some info on growing citrus in pots and indoors. 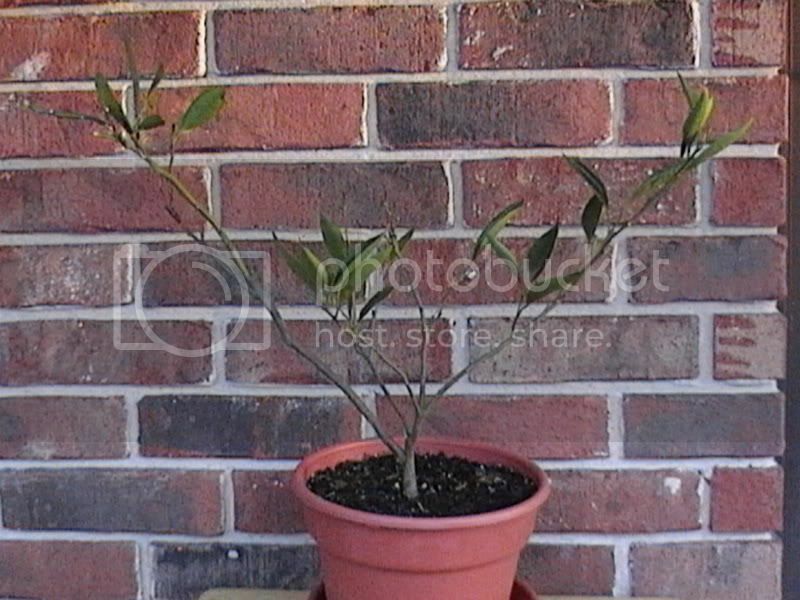 Most common citrus for pots is calamondin, limes, kumquats, lemons and limequats. Take a look here to see if you can id what you have. Maybe these sketches of different citrus leaves will help as well. Last edited by Newt on Sun Nov 12, 2006 9:31 pm, edited 1 time in total. Wow, Newt, you're very resourceful! Thanks a lot, you're awesome!! "The bound roots must be severed." Man, they weren't kidding when they said severed. I'm glad they had a picture to demonstrate what they were talking about. Whenever I transplanted something I only "massaged" the roots to loosen them. "Soak the root ball in Garrett Juice and water." I've never heard of Garrett Juice. Is that something I can get from a grocery store or from a nursery? Does the Garrett Juice help stimulate new root growth? Hyper Ferret, you are so very welcome! I'm glad you like the links. I have whole list of links bookmarked that I use over and over again, so it isn't any trouble to find them. If the rootball is tightly bound and teasing the roots isn't enough, you can sever them to stimulate new growth. If you can loosen the rootball enough for water to be easily absorbed in the center, and for the roots to be able to move out into the soil, then you don't need to sever them. Here's the recipe for organic Garrett juice. Sorry about that. Don't worry if you don't have all the ingredients. You can use an organic fertilizer like fish emulsion or fish emulsion mixed with sea weed and that will help your little tree. You can purchase these in liquid form from most garden centers. The fish emulsion smells unpleasant when you open it, so be warned NOT to breathe deeply! Usually pots are the same height as width, so measuring from top to bottom or across the top should be fine. When in doubt go with the height unless it's an oddly shaped pot or a tall and narrow one. You want enough room for the roots to move out into the soil without getting compacted, but not too much room that the soil will stay too wet. Sorry about the blood orange. It does look unappealing but I understand it's yummy. Were you able to id your friut tree? I am so saving all of these sites that you give me into my favorites!! Once I have the Garrett juice made up, how long do I let the root ball soak in there? Is it possible to over sever the roots? I have yet to check my root ball, I'm just wanting to be prepared. By looking at the pics of fruit I was still unsure of what mine would be. Seeing how my fruits were really yellowish and oddly shaped. When I looked at the leaf drawings, my guess would have been the tangerine, due to the rigidness of the leaf. Since then I have taken my tree outside (for photo quality purposes) and I pulled off the fruit. For fun and not sure of what to expect, I split open the two fruits. Oranges they are! ...Or tangerines or something along those lines. Again, they were small, yellow on the outside, and oddly shaped. But they had a very sweet and juicy taste!!! Now, that I have the fruit taken off, I can concentrate on the tree itself. I'm gonna try everything you've told me to do. I hope I can get it to survive through the winter. I'll have you know, I greatly appreciate all of your help! I have many pictures of the tree of when it was healthy and pictures of it's current condition. I've just figured out how to get my pics on the web. Would you like to actually see what's going on with my tree? If you make the Garrett juice don't forget to mix it with water. You could use 2 tablespoons to a gallon of water. Soak for about 30 to 60 minutes. You will want to be sure the entire center of the rootball gets soaked. Of course alot depends on the size of the rootball. If it's a small one you could soak for 15 to 30 minutes. It is possible to over sever the roots. The idea is to loosen them or sever ti release them so new roots can form and move out into the soil. If the roots are so bound that you can't tease them out, make about four cuts around the rootball, from top to bottom of the rootball for a small plant. 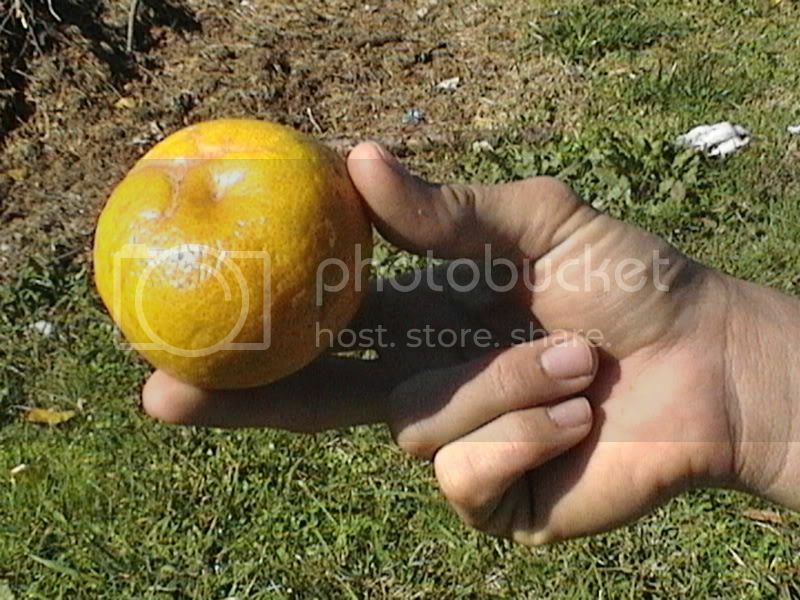 I'm guessing you know how to search on google for images of oranges, etc. If not, lmk. I would like to see the pics of your before and after tree. Btw, I just realized that I gave you the wrong link before for repotting. 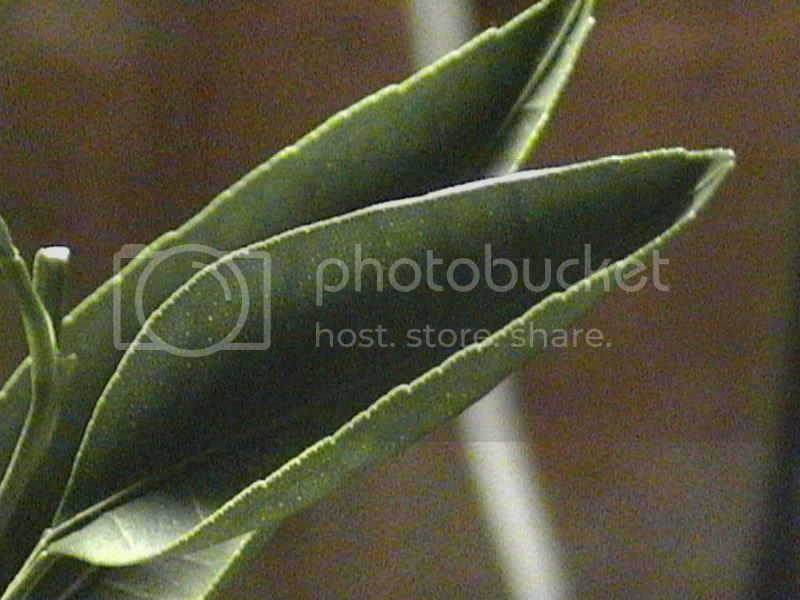 The first link to the rootbound pot was correct, but the second one was wrong and was pictures of houseplants. I've corrected it in the post, but here it is again. It shows how to pot up your plants. Fair Warning: I am a photoholic! Okay, I have quite a few pics I'd like to post. But I have a reason for each pic. Now, the lighting really is much better than what it appears in the photo. The only digi camera I have is inside of my camcorder. As you will see, it takes much better pics with the aid of natural sunlight. Lets start with when it was healthy. 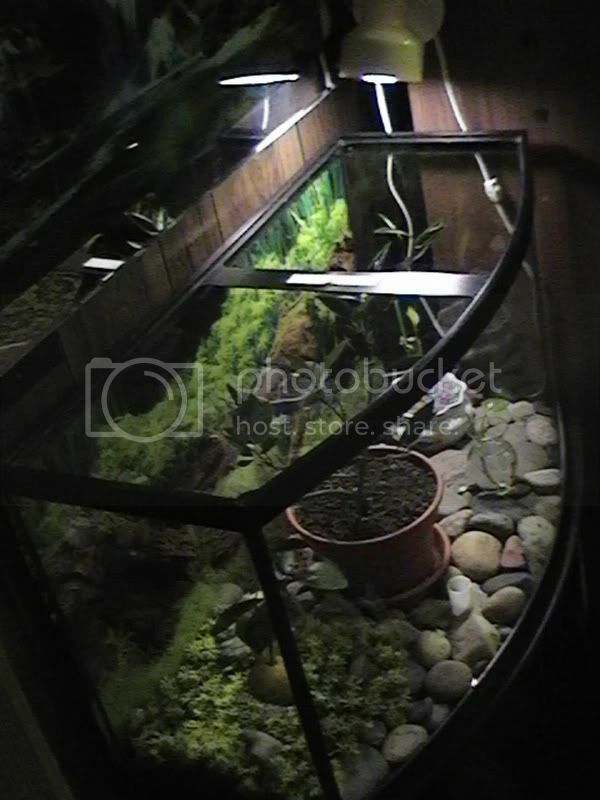 Here's the 46 gallon Bow Front fish tank I keep it in. Trying to show the size of my fruits. This is what a lot of the leaves and stems are doing. Took my tree outside (for photo quality purposes). The biggest fruit before and after I split it open. 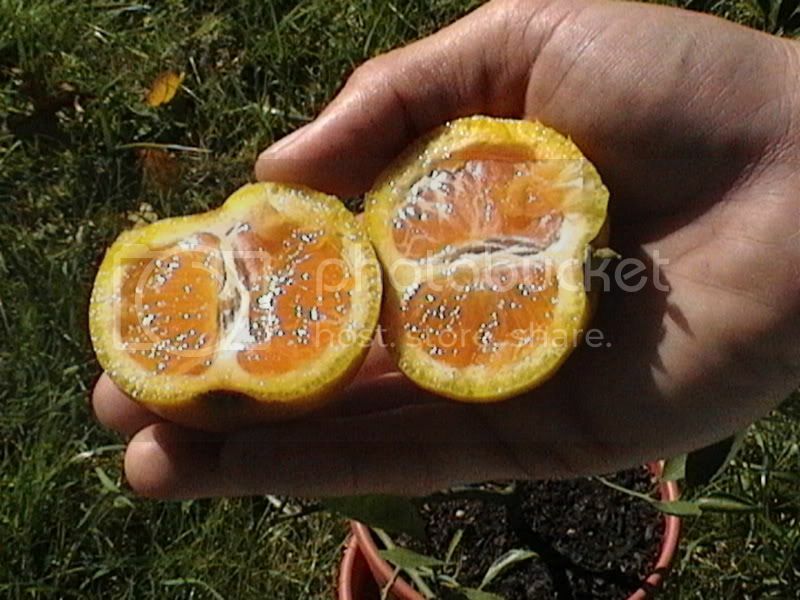 The smallest fruit split open. Ahhhh ... relief from the weight of the fruits. Wow, great pics!! Looks like it's being overwatered. Are you letting the soil dry slightly before watering again? Thank you for the compliment on the pictures! Yes, most of the time I let it dry out. Um .... truthfully sometimes I forget to water it and it really dries out. 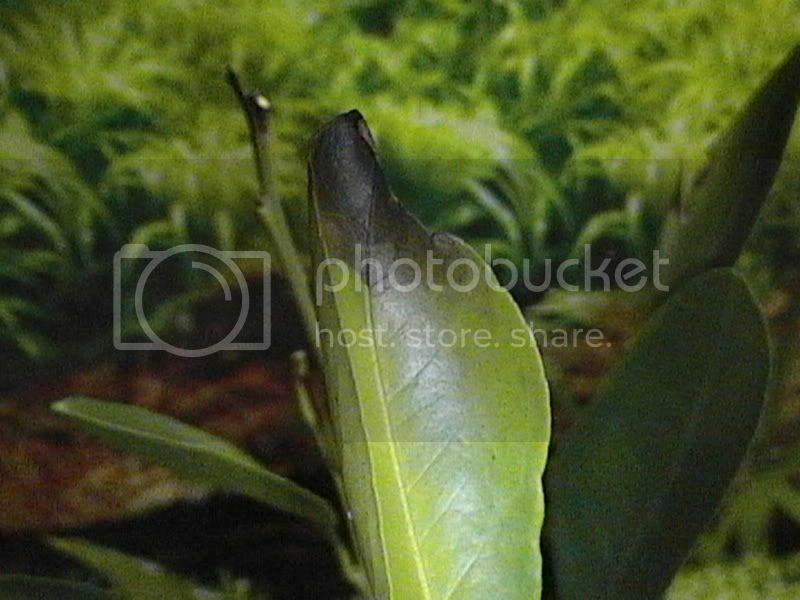 Now, on the pic of the unhealthy leaf with the black tip. It may look like it was burnt by being to close to the light but the leaf pictured is actually located furthest from the light. I've been told that having the tree in the tank will not allow proper air circulation which the tree needs. Is this true? If so, can I not hang/mount a tiny fan on the tank to create my own air circulation? Also, I'm not sure if I read it off the Internet or off of this thread, but I read somewhere that the tree requires high humidity so I should be spritzing the tree with a spray bottle. I haven't been doing this before I read that. Is that part of my problem? Argh! Only 24 leaves left! (Just went to count them) It is sooo not good if you can easily count how many leaves a tree has. It truly looks like some type of rot or fungal problem. I do think you should take it out of the fish tank and keep it out. You could try the fan idea but I'm not sure that will help at this time. Please forgive me if I'm repeating myself, but I'm having one of those days. I would suggest you take it out of the pot, if you haven't already, and look for some type of root rot. Take a look at the possibilities here. Look especially at foot rot, feeder root rot, twig dieback, greasy spot and slow decline. 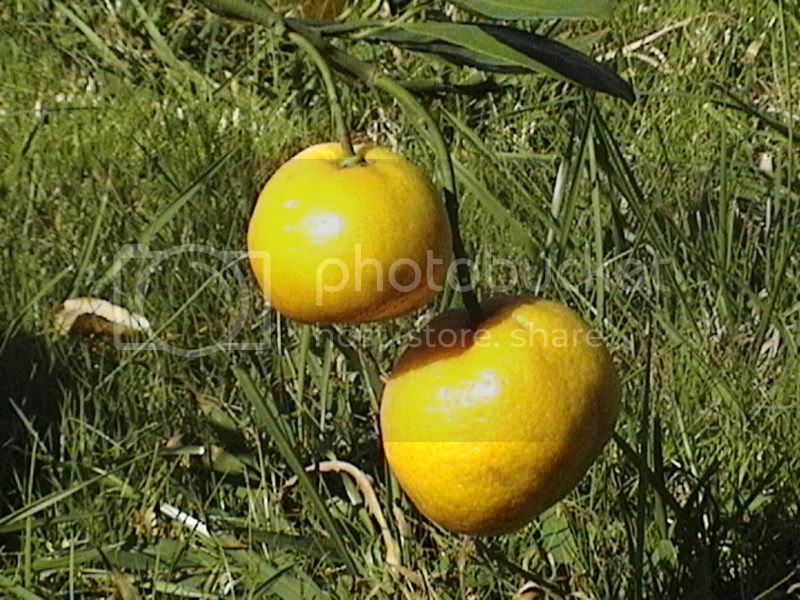 I do no that is not a lemon or Calmondin it is either a manderin, sastuma, clementine or tangor I can really pin point what it is. 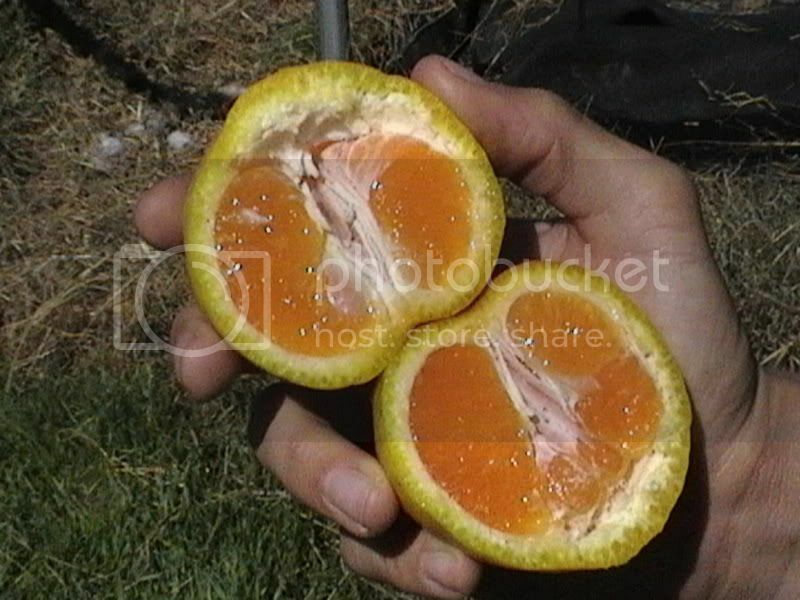 Do you remember anything that labeled it from when you bought it, what does it taste like sweet tart, bitter this could help in finding out what your problem is some citrus are harder to take care of because of the conditions they can handle. The black that I saw on some of the leaves and branches, leads me to believe that you have a fungal infection. Try spraying your tree weekly with an aerated compost tea. If I have time tonight I'll look up the different organic methods of dealing with a fungal infection. For now though, aerated compost tea will provide the plant with a healthy flora and fauna to combat any pathogens. Seeing how the tips of the branches are blackened, I'm thinking that the fungal infection is in the soil or root system. I could be wrong, but it's just a feeling. Opa, what do you think of these home made remedies?